I want to make two short comments. Clonidine was introduced in 1966. 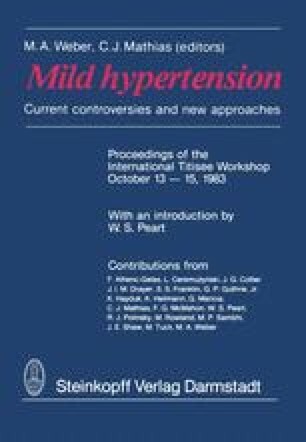 A year later a paper was published entitled ‘The use of Clonidine in mild hypertension’ which provided statistics about the number of people who responded successfully and the number who did not. The range of blood pressures in those patients extended up to 230/120 mm Hg. In 1967, people must have been quite liberal in their definition of mild hypertension. The second point is that, like many other drugs, when Clonidine was first introduced it was used in atrociously high dosages and I think some of the serious side-effects which occurred were the result of those high dosages. Personally I think that a lot of relearning needs to be done about this drug, including a fresh look at it as a candidate for initial therapy in mild hypertension.